Immunoproliferative disorders: Malignancies of the immune system (multiple myeloma, lymphoma, leukemia, etc.). Immune-mediated inflammatory conditions are characterized by immune dysregulation, resulting in acute or chronic inflammation and causing end organ damage. One causal manifestation in immune dysregulation is the inappropriate expression of proinflammatory cytokines such as IL-1, IL-6, and tumor necrosis factor alpha. Often, oral cavity may be the first site of manifestation of these debilitating recurrent diseases, forcefully limiting many oral functions of the patient including nutrition, and thus, compromising their quality of life. The treatment of these disorders should be directed not only toward relief from symptoms but also toward treating the underlying immune dysregulation, prevent recurrences, and preserve organ integrity and function. The control of immune dysregulation can be achieved by the use of immunomodulators, defined as natural or synthetic substances that help regulate or normalize the immune system. In other words, they correct immune systems out of balance, i.e., strengthen weak immune systems or moderate over reactive immune systems. Immunomodulators may be further classified into immunostimulants and immunosuppressants. 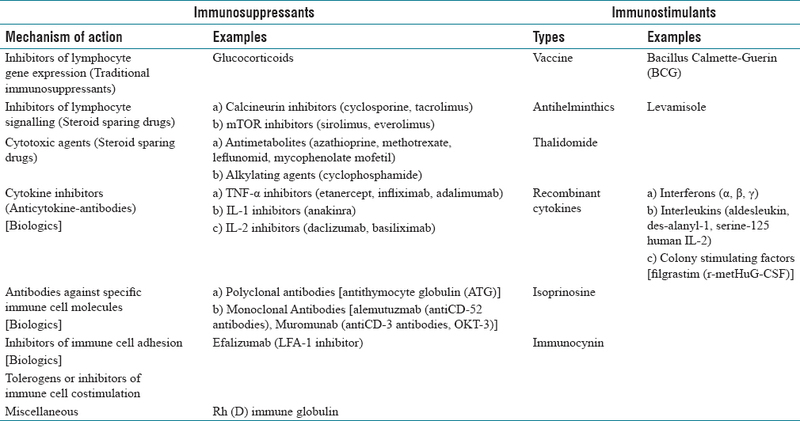 The classification of immunomodulators is given in [Table 1]. Immunostimulants are agents that are envisaged to enhance body's resistance against infections; they enhance the basal levels of immune response, especially in immunodeficiency. Immunosuppressants are agents that suppress the immune system and are used for the control of pathological immune response in autoimmune disease or hypersensitivity. This review would focus on newer groups of immunosuppressants and their use in oral mucosal disorders. Immunosuppressants are agents used to suppress the over reactive immune system causing damage to the host as in autoimmunity or hypersensitivity. Based on the mode of action and origin, they may be broadly classified as traditional immunosuppressants, steroid sparing drugs, and biologics. The mode of action and indications of these various groups are detailed further. Traditional agents used for immunosuppression are glucocorticoids, acting both systemically or topically as anti-inflammatory immunosuppressants. Glucocorticosteroids exhibit intervention at several points in the immune response and appear to affect many aspects of inflammation. In fact, corticosteroids have evolved and emerged as the mainstay of therapy for numerous oral lesions and conditions with an allergic, immunologic, or inflammatory basis. Oral hypersensitivity disorders such as plasma cell stomatitis, fixed drug eruption, angioedema, oral allergy syndrome, and lichenoid eruptions. However, long-term use of corticosteroids, as required in these disorders, results in several adverse effects, including gastric ulcer or upper gastrointestinal bleeds, hyperglycemia, hypertension, myopathy, osteoporosis, altered response to physical stress, adrenal insufficiency, opportunistic infections, Cushingoid habitus, cataract, and glaucoma. Search for alternative drugs resulted in the use of steroid sparing drugs that permit partial withdrawal of corticosteroids. Sometimes immunosuppressive medications are given in addition to or instead of steroid therapy to lower the dose of steroids needed, and thus, spare some of the undesirable side effects of steroid therapy. Therefore, these drugs are sometimes called “steroid-sparing” medications or “adjuvant” drugs. Nonsteroid immune-suppressive drugs that permit partial or total withdrawal of corticosteroids is thus known as steroid sparing therapy. These agents can be further subdivided into the following categories based on their specific mechanism of action – alkylating (cyclophosphamide and chlorambucil), antimetabolite (methotrexate, mycophenolate mofetil, and azathioprine), and antibiotic/calcineurin inhibitor (cyclosporine, tacrolimus, and sirolimus). The success of corticosteroid sparing therapy may be defined as – (1) the ability to reduce systemic corticosteroid to a daily dose of 10 mg of oral prednisone or less; (2) clinically reduced inflammation; (3) stabilization or improvement in symptoms such as pain; and (4) patient tolerance of any drug-related side effects. Biopharmaceuticals – biologics, biologicals or biological agents (BAs) – are any medicinal product manufactured in or extracted from a biological source. Biologics often target immunocytes or their products, thus targeting specific steps in proinflammatory pathways. Their mode of action is by blocking specific pathways involved in the pathophysiology of immune mediated and neoplastic diseases. These agents promise a more targeted anti-inflammatory or immunosuppressive action in comparison to corticosteroids and classic corticosteroid-sparing immunosuppressants. Hence, probably, they represent a pathogenesis-based treatment and not just palliative therapy, and may consist of a cytokine, antibody, or fusion protein. Receptor constructs or fusion proteins are created through fusion of different genes encoding for the same protein. Chimerization involves replacing segments of the antibody produced in a mouse that distinguish it from a human antibody, to reduce adverse reactions; this is shown by inserting -xi- into the name. Biologics include a number of human (suffix “mab”), humanized (suffix “zumab”), or chimeric (mouse–human; suffix “ximab”) monoclonal antibodies or variant fusion proteins (suffix “cept”). The four main classes of BAs are TNF-α inhibitors, lymphocyte modulators, interleukin inhibitors, and miscellaneous agents. NF-κB (Nuclear factor-kappa B) transcription factor. The details of various biologics are given in [Table 3]. There is a new range of therapeutic solutions to steroid resistant or recalcitrant oral lesions available in the form of steroid sparing drugs and biologics. However, more randomized control trials with the use of these newer drugs should be conducted to elaborate the risk–benefit ratio in the management of patients with oral lesions. Agrawal A, Daniel MJ, Srinivasan SV, Jimsha VK. Steroid sparing regimens for management of oral immune mediated diseases. J Indian Acad Oral Med Radiol 2014;26:55-61. Atkinson JC, Moutsopoulos N, Pillemer SR, Imanguli MM, Challacombe S. Chapter 20. Immunologic diseases. In: Glick M, editor. Burket's Oral Medicine. 12th ed. USA: People's Medical Publishing House; 2015. p. 489-520. Walker DM. Oral mucosal immunology: An overview. Ann Acad Med Singapore 2004;33(Suppl):27-30. Nagapreeti N, Rajeshwari P. An overview of immunomodulators. Int J Curr Pharm Clin Res 2014;4:108-14. Sanghavi J, Aditya A. Applications of corticosteroids in dentistry. J Dent Allied Sci 2015;4:19-24. Kehrl JH, Fauci AS. The clinical use of glucocorticoids. Ann Allergy 1983;50:2-8. Tripathi DK. Corticosteroids. In: Essentials of Medical Pharmacology. 5th ed. New Delhi: Jaypee Brothers Medical Publishers (P) Ltd; 2003. p. 254-65. Tamesis RR, Rodriguez A, Christen WG, Akova YA, Messmer E, Foster CS. Systemic drug toxicity trends in immunosuppressive therapy of immune and inflammatory ocular disease. Ophthalmology 1996;103:768-75. Kruh J, Foster CS. Corticosteroid-sparing agents: Conventional systemic immunosuppressants. Dev Ophthalmol 2012;51:29-46. Myers TD, Smith JR, Wertheim MS, Egan RA, Shults WT, Rosenbaum JT. Use of corticosteroid sparing systemic immunosuppression for treatment of corticosteroid dependent optic neuritis not associated with optic neuritis. Br J Opthalmol 2004;88:673-80. Patil US, Jaydeokar AV, Bandawane DD. Immunomodulators: A pharmacological review. Int J Curr Pharm Clin Res 2012;4:30-6. Kavanaugh A, Broide DH. Chapter 94: Immunomodulators. In Adkinson NF, Bochner BS, Busse WW, Holgate ST, Lemanske R, Simons FE, editors. Middleton's Allergy: Principles and Practice. 7th ed. USA: Mosby Elsevier. p. 1643-8. Riano-Arguelles A, Martino Gorbea R, Iglesias Zamora ME, Garatea Crelgo J. Topic tacrolimus, alternative treatment for oral erosive lichen planus resistant to steroids: A case report. Med Oral Patol Oral Cir Bucal 2006;11:E462-6. Thongprasom K, Carrozzo M, Furness S, Lodi G. Interventions for treating oral lichen planus. Cochrane Database Syst Rev 2011;CD00116. Martin LK, Werth V, Villanueva E, Segall J, Murrell DF. Interventions for pemphigus vulgaris and pemphigus foliaceus. Cochrane Database Syst Rev 2009;CD006263. Vyas N, Patel NS, Cohen GF. Mycophenolate mofetil as a first-line steroid-sparing agent in the treatment of pemphigus vulgaris. J Drugs Dermatol 2013;12:210-6. Mutasim DF. Therapy of autoimmune bullous diseases. Ther Clin Risk Manag 2007;3:29-40. Georgakopolou EA, Scully C. Biologics: What they are, how they affect oral health and how they can modulate oral health care. Br Dental J 2015:218:671-7. Georgakopolou EA, Andreadis D, Arvanitidis E, Loumou P. Biologic agents and their clinical implications. Acta Dermatovenerol Croat 2013;21:24-34. Furst DE, Keystone EC, Braun J, Breedfeld FC, Burmester GR, De Benedetti F, et al. 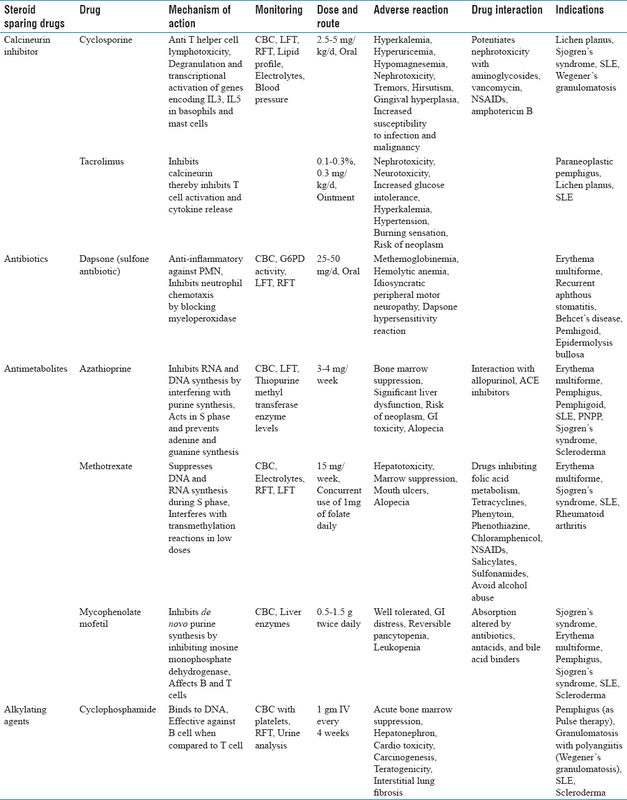 Updated consensus statement on biological agents for the treatment of rheumatic diseases, 2010. Ann Rheum Dis 2011;70(Suppl 1):i2-36. Liles WC, van Voorhis WC. Review: Nomenclature and biologic significance of cytokines involved in inflammation and the host immune response. J Infect Dis 1995;172:1573-80. Wu Y, Zhou BP. TNF-alpha/NF-kappaB/Snail pathway in cancer cell migration and invasion. Br J Cancer 2010;102:639-44. Maxwell LJ, Singh JA. Abatacept for rheumatoid arthritis: A Cochrane systematic review. J Rheumatol 2010;37:234-45. Leonardi CL. Efalizumab: An overview. J Am Acad Dermatol 2003;49:98-104. Sfikakis P, Markomichelakis N, Alpsoy E, Assad-Khalid S, Bodaghi B, Gul A, et al. Anti-TNF therapy in the management of Behçet's disease— Review and basis for recommendations. Rheumatology 2007;46:736-41. Vujevich J, Zirwas M. Treatment of severe, recalcitrant, major aphthous stomatitis with adalimumab. Cutis 2005;76:129. Yarom N. Etanercept for the management of oral lichen planus. Am J Clin Dermatol 2007;8:121. Elliott T, Campbell H, Escudier M, Poate T, Nunes C, Lomer M, et al. Experience with anti-TNF-α therapy for orofacial granulomatosis. J Oral Pathol Med 2011;40:14-9. Moutsopoulos NM, Katsifis GE, Angelov N, Leakan RA, Sankar V, Pillemer S, et al. Lack of efficacy of etanercept in Sjögren syndrome correlates with failed suppression of tumour necrosis factor α and systemic immune activation. Ann Rheum Dis 2008;67:1437-43. Antoni C, Braun J. Side effects of anti-TNF therapy: Current knowledge. Clin Exp Rheumatol 2002;20(Suppl 28):S152-7. Ramos-Casals M, Brito-Zerón P, Munoz S, Soria N, Galiana D, Bertolaccinin L, et al. Autoimmune diseases induced by TNF-targeted therapies: Analysis of 233 cases. Medicine 2007;86:242-51. Guarneri V, Miles D, Robert N, Dieras V, Glaspy J, Smith I, et al. Bevacizumab and osteonecrosis of the jaw: Incidence and association with bisphosphonate therapy in three large prospective trials in advanced breast cancer. Breast Cancer Res Treat 2010;122:181-8.